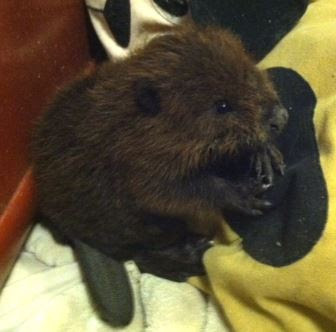 Back in April of 2015, a very pathetic little baby beaver came into Freedom Center. Smaller than a guinea pig, covered in ticks, thin and dehydrated, we were not sure if he was going to survive. He was found on the Rancocas River by people in their boat. After noticing he was being chased by another large beaver, and then realizing that he was in danger and not being chased by a parent, he was scooped up after he attempted to climb in their boat! We knew after assessing his condition that he was away from his family for a long time and chances of reuniting him after he was well again were low. So began the two year journey of making him healthy and raising him to adulthood. We removed about 50 ticks, most of them in his ears and around his eyes. Then we addressed the dehydration, adding electrolytes and antibiotics to his diet. Next, it was the struggle of getting him to drink formula from a bottle. All of our volunteers loved him, but hated feeding time! We had to wrap him up like a burrito to keep him still just so he would stay still to drink. Thankfully beavers are weaned earlier than most other mammals, and it wasn’t long before he was trying apples and sweet potatoes along with his willow and poplar twigs. And did I mention water? Keeping it clean, watching him swim, making sure he was drinking enough-it really was like taking care of a one year-old child! The following summer of 2016, it was time to set him up in his outdoor enclosure. He had a big dog igloo, lots of logs, cut trees, and a deep water trough. All of our previous beavers used the igloo to start their den, using mud and branches all around it to make it warm for winter. However, this beaver was a true architect — he built his “dam” around the igloo, up and behind it, tunnels around and through it, and covered a third of the enclosure!